I have to thank Hatefarm for the unintentional inspiration for today’s comic. Go check out their stuff it’s super funny and NSFW. I am ARG has made it into the Final four of the NSFW webcomic tourney. This is a tough round as we’re going up against some big names in Webcomics, not just NSFW webcomics. A lot of readers have already expressed how hard it is to choose who to vote for. I thank everyone who has given ARG their vote so far. The love is felt! I always assumed people from the future wore flight suits all the time, rendering guard rails pointless. There’s alt-text in I AM ARG?! Well, Gary is screwed. Unless, of course, a ship randomly exits light speed and materializes around him. Also… Double color strip all the way across the website? What does it mean!? I like to pretend Gary in this comic is Gary Cohen. Actually, I kinda modeled them after you and rob. Oh, oh oh! I see the sideburns! …and pink pants! SCORE! Congrats on makin it to the semi-finals in the NSFW thingy. I feel sorry for clusmy people, people who are afraid of heigts, and the ones who are falling right now. I feel especially sad for the ones falling. That never happened on the Jetsons, right? Why were they so high in the air to begin with? Because they were UPPER middle class. Ha cha cha cha chaaaaaa. BAH DUM TSH!. SAD TROMBONE. You really don’t like bald people do you? 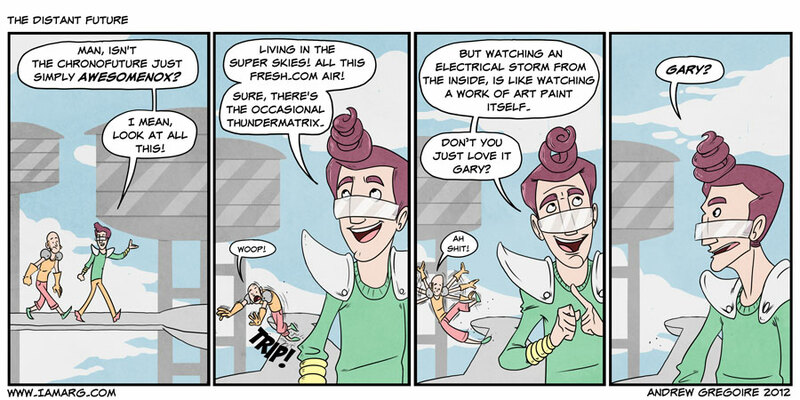 Also, this is why I always hoped I would never have to be in a future like the Jetsons. I would never leave my house for fear of falling to my doom by walking out my front door. I have no idea what you’re talking about, I love bald dudes. I always wondered if people ever got sick when they first started making these kinds of apartments in the Jetsons, they would throw up and the mutants down below suffered from the vomit rain. I’m sure there’s some form of vomit filtration system. That, or there’s no disease in the super skies. He belongs to the Crawlers now, if he survives that is. Under the thick blanket of smog and muck that man has produced over the years live The Crawlers. But just what is a Crawler? To put it frankly, if the Hills Have Eyes made sweet love to a mole-man, their love child would be a Crawler, and they dominate the wasteland that is future Earth. So, if young Gary does survive the fall into the barren reality, and play his cards right, he shall either be worshiped by the Crawlers as a god from the sky. Or will simply be another lamb, to the slaughter. Sleep Deprivation: For when you want to ramble. sleep deprivation leads to some creative reasoning. Me likes. I often had this thought when watching shows/movies that had those kinda walkways! I may have used more colorful metaphors if I was gary though! Oh, and I’ve added my vote! Go Arg!!! His swirl looks like cat sh*t. Was that done on purpose or is it just me? First time commenter by the way. Love your comic. I found myself in that moment where the toilet becomes your throne upon which time itself is forgotten and your task at hand is not the same as when you started. Subconsciously, you continue until you reach the point where there is nothing else to see. For me, that has been this comic from start to finish. Great work on the comic! …now if you’ll excuse me I should probably finish what I came here to do first. Poor Gary….they can clone him right? My brain screamed “Anachronox” in the first panel… intentional?